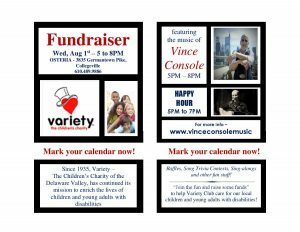 Join us on August 1 at Osteria for a fundraiser to benefit Variety. Vince Console is a brilliant musician and a friend of Variety. He will be showcasing his vocal and guitar talents at a fundraiser he is holding to benefit Variety. Mark your calendar for an exciting night of music, trivia, and games at Osteria. The show will run from 5PM to 8PM on August 1 at Osteria in Collegeville. The money raised will benefit Variety – the Children’s Charity. Thanks, in advance, for your support. We look forward to seeing you there!